I'm getting a set of leathers and haven't found much info regarding the cons of a speed hump on the rider's suit w.r.t. a pillion. I normally like my jacket with the speed hump because it's some extra foam up on the neck area and it seems like it will prevent my head from snapping back for at least low speed knocks - I have no illusion that it will help me go faster at the speeds I travel, but it's kind of like wearing a backpack snowboarding. Having fallen on my pack a ton when boarding, I realize that it's nice to have there so my back takes less abuse. That being said, does the speed hump interfere with positioning or cause discomfort for the pillion? It seems like another factor to help prevent lid bumps, but I know nothing in this arena. Also I have noticed options for smaller humps. These have any merit? If by "pilion" you mean passenger, like we say here in the Murrica, I would say if you are riding such that you need the adding safety and protection of a hump... you aren't going to have a passenger aboard. Thats just my opinion. Solo- yes, ride it like you stole it. 2up- probably want to go a little easier. If you do decide you are railing to the point of hump needed, will the passenger also have a full suit and hump? pillion is the passenger wj.. you are correct. silly brits..
to answer your question.. NO the hump wont normally bother the passenger you are this guy..
Last edited by onel0wcubn; January 4, 2012 at 07:31 AM..
Did her bump bother you? Hahahah, no I don't think I'll be needing the hump for protection when riding 2-up. In fact, we probably won't get out of the large parking lot before I'm very confident my lady and I are comfortable with everything. 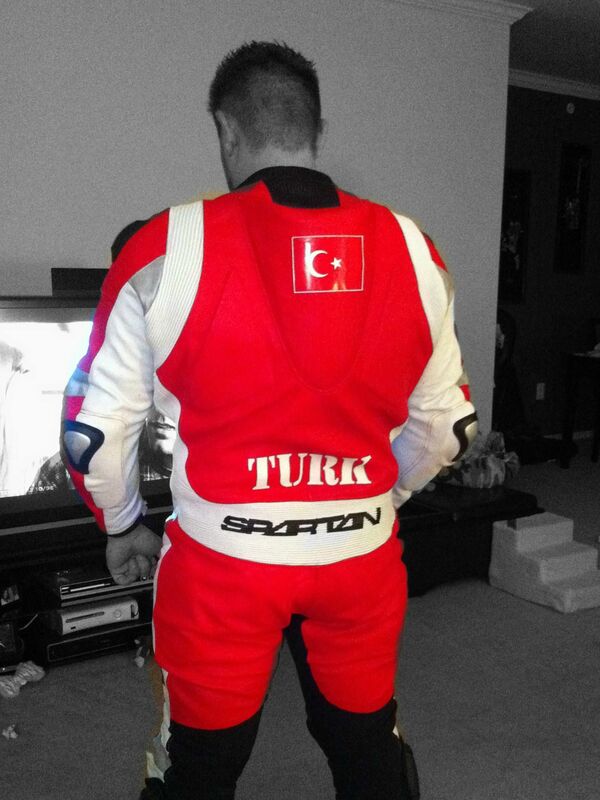 But I want to use this suit for track days and for street riding as well and the hump will be for the potential (i.e. likely) spill at the track. Tecknojoe, do you run a small or big hump on the back of your suit? Not sure what the conventional sizing jargon is, but spartan leathers just has those options, large or small. I always ride with my hump back leathers and have rode toped out with a chick on the back...they tell me its not uncomfortable..but they they cant lay there head flat against my back to help keep the high wind from making there neck sore. I dont think it will be a problem. All of my suits have a speed hump and don't ever seem to bother me even when I wear a backpack(unless fully packed). I wouldn't get a suit with a speed hump just to prevent helmet contact with the ground. I think if you are smacking your melon on the ground that few inches won't make much of a difference but if it is a minor crash I guess it could prevent small abrasions to the helmet.. I think it may be more likely to cause a neck injury instead of a head injury. I have trashed a good amount of helmets and every time I was wearing a suit with a speed hump. If I was you I would be more worried about getting a suit with a good back protector in it or purchasing one separate and always wearing it. Unless you are running all the way through 6th gear on the track and racing for points I wouldn't worry about focusing on that. Get a suit you like that has good protection and if it comes with one so be it. Don't forget your back protector. Just reread your post. I don't think riding two up with a speed hump would be a big deal. The passenger generally has their head leaned to the left or right of your head anyways. Unless they are trying to tuck in right behind you it shouldn't matter. Last edited by JUSTGO; January 4, 2012 at 05:23 PM.. Thanks all for the quick responses, will help me if I do manage to get everything else decided for the order this weekend. As long as we're on the topic, I wouldn't mind any other recommendations from those of you with experience with the onesies. My only experience there is in the pajama department. I'm still deciding on 1 or 2 front zippers, collar or no collar, perforation or not (I'm thinking not), and still need to size myself. I'll probably end up with no hump or the small one. The one in the pics looks like it was made for Quasimodo. 2 zippers is way easier to get in and out of. I have suits with one zipper and I have a much harder time getting out of it than my friends that have 2 zippers. I have never thought about the collar option. Perforation depends on what conditions you will be riding the most in. I honestly wish I had one of each. I bought all mine with my thought process being that they were for the track first and street second. It has to be pretty cold on the track for me to get cold wearing a perforated suit and if it is that cold I probably won't be on the track. If I am on the street and it is that cold I generally am just going out for a chill ride and don't wear a one piece.